A Great 90th Anniversary Celebration! 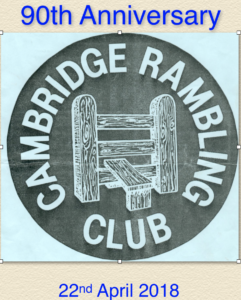 Sunday April 22nd, 2018 marked the CRC’s 90th Anniversary – and there was a great turn-out of more than 140 Club members at the Townley Memorial Hall in Fulbourn to celebrate! Before the event, three separate walks were on offer and were well-attended. We were blessed with great summer weather and everyone enjoyed the long-awaited burst of spring blossom and foliage. The Celebration itself began at 3.00pm, with a great spread on offer. It was wonderful to meet up with many friends, old and new. And throughout the afternoon a magnificent photo show was a great attraction, detailing every decade of the Club’s existence, right up to March 2018! David and Norman made sure that we have a good photographic record of the Anniversary itself – and a link to the photos will soon be available. Many thanks to the unstinting efforts of the Club members who ensured we had such a memorable occasion: Jenny, Joan, Rita, Anne and Miranda.